Fig. 8.1-6. Transverse section of root of buttercup (Ranunculus). In roots, xylem and phloem do not form bundles as in stems. 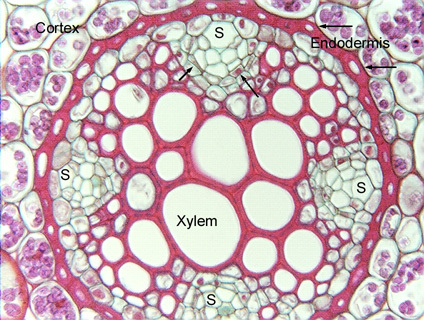 Instead, the xylem (at least in most dicots and gymnosperms) forms a solid mass with three or four "arms" and the phloem lies in between the arms. Again, we look for it by first finding the xylem and then hunting for sets of empty-looking cells. The four sets here each have one sieve tube member marked with "s," and each set has several other unmarked sieve tube members. In the phloem at the top of the micrograph, it is possible to identify some companion cells due to their flat, boxy shape and dense cytoplasm (arrows).